I have had a few pink hollyhocks bloom this month. It's a nice surprise to see the flowers peeking through the leaves. Usually they are very tall and vibrant in March. These are shorter and mellower. The zucchini plants are still producing. They aren't as vigorous, but they still provide. I just love the taste of fresh zucchini after it has been cooking. I mash it with butter, salt, and pepper. It's so tender and fresh. I'm so glad that I planted it. The years that I have skipped growing it, I really missed it. It's not the same from the store. The artichoke plants are coming back; I hope they produce well again this year. I let them flower last season, so I don't know if they will have enough energy to develop lots of artichokes. I have been feeding them compost and compost tea. It seems to be revitalizing them. The straw mulch appears to be helping the soil, too. It all works together. I planted a packet of zinnias in this large pot in my driveway. They are just starting to bloom. It's so nice to have some bright, colorful annuals at this time of year. Zinnias are one of my favorite old fashioned flowers. The bees and butterflies are attracted to them, too. 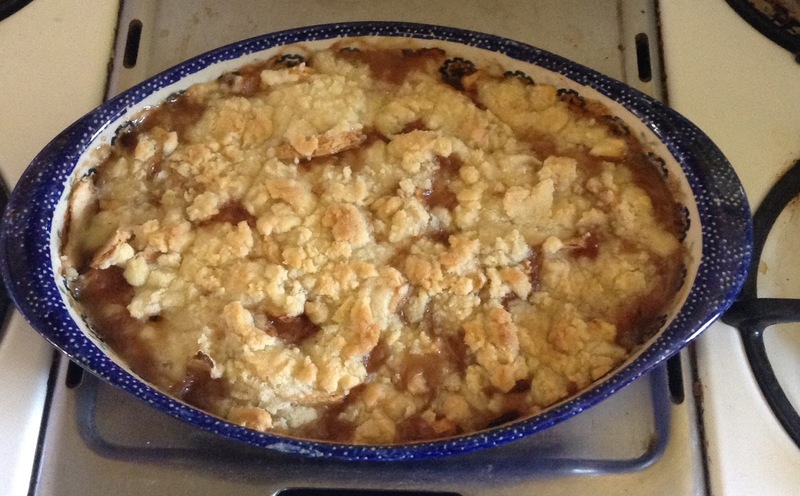 I made an apple crisp the other day. Apples have been on sale at Valley Produce, where I shop. They were only .69 a pound. I basically buy what's on sale each week, and work my menus around those ingredients. Last night I was enjoying the night sky and cool air while relaxing out on my porch. I decided to splurge, and let myself have a cafe au lait after dinner. Normally I just have two per day, and I drink them in the morning. After brewing the espresso and heating up the milk, I felt like I was out on the balcony of a cruise ship. It was so relaxing and decadent. It's funny how the little pleasures in life can add so much quality and joy. Yes, you should, Andrea. Mine come back each year. I love all the different varieties. There are lots of photos on this blog of artichoke plants. They get huge! So do I, Meg. It's so exciting to see them go from seeds in the soil to brightly colored flowers. Ooh artichokes! It's so nice that you can grow them in your area. It's one of my favorites. Your apple crisp looks delicious. Thanks Nil. Artichokes and asparagus are my favorite vegetables. I just bought some extra large ones at Costco. It will be nice to have them growing again here. Your flowers are beautiful - and so is your garden. I can almost taste that apple pie!! Thank you, Angela. It's easier to grow flowers this time of year. During the hottest months they fry. I have never tried artichokes... do they take up a lot of space? My head is already planning next summers garden. I love this time of year when things are settling down for the cooler weather to come. My avocado seedlings are coming on in leaps and bounds. Your garden looks wonderful Stephenie. My mum has hollyhocks growing. I bought them for her last year and they have flowered consistently ever since. They have put on a beautiful display with lots of different colours. Your artichokes look like they may do well this time. Must be all that extra feeding of nutrients. Thank you, Tania. I am always amazed at the photos of your garden. You grow so many different things! We must be on the same apple wavelength this week! Yesterday Steve and I took a drive to Julian which is famous for its apples, especially the namesake Julian Apple. We had apple pie a la mode for lunch. It was so tasty and well worth the 45 minute drive there and 45 minute drive back. I love artichokes and asparagus too. I've never heard of Julian apples, Anita. I will have to google them. I used Granny Smith apples for the apple crisp. Apple pie a la mode sounds delicious!